Bruce Springsteen: "Devils & Dust"
Bono once said of Bruce Springsteen that his eyes "see through America," that his nickname may be "the Boss," but actually, "he works for us." Indeed, a new Springsteen album is an occasion to hear a more reliable State of the Union address than those delivered by any U.S. president. Too bad we have to wait so long between releases. Throughout his 32-year career Springsteen has tried to balance the rock in his sound with the poetry of his lyrics. 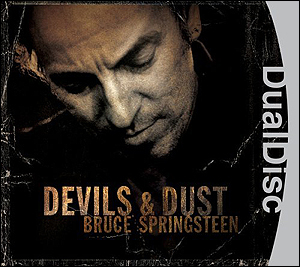 "Devils and Dust," his newest album in three years, alternates between bone-bleached narratives and upbeat rockers without the aid of his posse, The E Street Band. While the overall effect may not feel as inspired as 2002's "The Rising," or as emotionally raw as 1982's "Nebraska," it's still a captivating collection of songs resonating with the barren landscapes that lie alongside every wide open road. Over the years, Springsteen has made an effort to identify with the American singer/songwriter tradition that includes current wunderkind, Conor Oberst of Bright Eyes and stretches back through Steve Earle and Bob Dylan to dustbowl balladeer, Woody Guthrie. What these artists share is a compulsion to illuminate the suffering of the dispossessed and embody the conscience of a nation in a highly personalized vernacular. "Devils and Dust" succeeds in this by encapsulating the sense of trauma and moral uncertainty that has engulfed the U.S. since the 9/11 attacks. Easily the standout track on the album, "Devils and Dust" is a powerful tome that benefits from Brendan O'Brien's sympathetic production and the dramatic orchestral accompaniment of the Nashville String Machine. If only the rest of the album maintained this intensity. Unfortunately, it doesn't and the next two tracks, "All The Way Home" and "Reno" are the album's only duds. On "All The Way Home," the singer may claim to "know what it's like to have failed/With the whole wide world looking on," a possible reference to Springsteen's pro-Kerry stance during last fall's U.S. election, but what, if anything, he has learned isn't apparent here. The pedestrian arrangement and woefully derivative guitar riff wouldn't be out of place on his 1992 career low, "Human Touch." And sat in front of me on the bed"
The song's rusty slide-guitar, scratching like nails on a blackboard, only enhances the discomfort. "Silver Palomino," a skeletal acoustic piece reminiscent of 1995's "The Ghost of Tom Joad," conjures Tom Russell's cowboy/vaqueros songs, complete with references to mustaneros (mustangs) and the pradera (prairie), as the album footnotes spell out. It's a potent reminder that miracles can happen and in fact, may need to be willed into existence. The final song, "Matamoros Banks," is a compelling reminder of the suffering caused when migrant workers from Mexico try their luck crossing the U.S. border in pursuit of the American dream. Too many die trying, their bodies left where the "turtles eat the skin from your eyes, so they lay open to the stars." It's a grizzly image of abandonment, one that turns the Statue of Liberty's "huddled masses" message on its head. As a Canadian, Springsteen's allure for me has been his enduring ability to uncover the darkness at the edges of the "runaway American dream" that he identified 30 years ago on his signature song, "Born To Run." While "Devils and Dust," may not be a perfect address, it succeeds in delivering the warning that America in 2005 has run off course. Someone take the wheel ... please. Now you can register as a citizen reporter with our new English login system! Keep track of the number of people who read your stories, readers comments and the cybercash you earned. The registration process is quick and free. A FAQ and step-by-step slide show (PowerPoint) will help you get started. OhmyNews is looking forward to receiving stories from your part of the world.